The Central Florda Rydaz Seminole County Chapter was the first Charter given by the LC. Based out of Sanford Florida and ran by CFR Soulja "Tha Truth". This is the most non-traditional Chapter in the Club. With the majority of the members brought in without Club Prospect, the Chapter has been given the "Syndicate" name to reflect that in it's origin, it was NOT a chartered Chapter. Truth moved to Sanford Florida and unable to keep his commitments to the Lake County Chapter, became a NOMAD. During this time he gathered his own Crew and made enough progress that his crew was allowed to represent the CFR as Supporters and as a Syndicate. After a year of Support, they were officially recognized as an official Chapter, though the Syndicate name stuck. Non-Traditonal in the since that the SemCo Syndicate do not wear Colors, but tend to stick to the bandanna and color scheme clothing to be recognized. Even though this is a "gang" practice, The Syndicate has not been indicted on any charges or Gang activities in Seminole County. They also have a "rotating" Clubhouse, and host their parties at different locations as designated by Tha Truth. 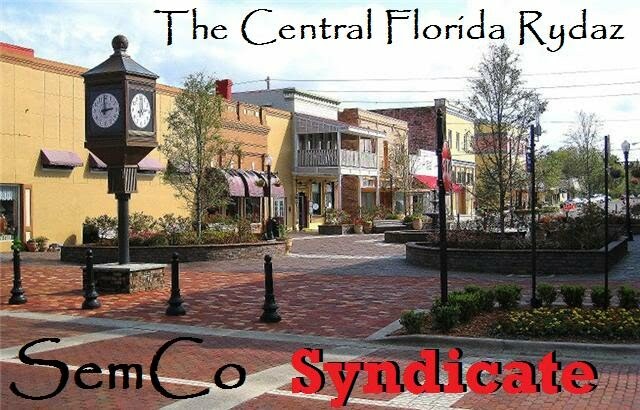 The Syndicate host Sanford's annual Thunder in the Streets Motorcycle rally every year for the Central Florida Rydaz.